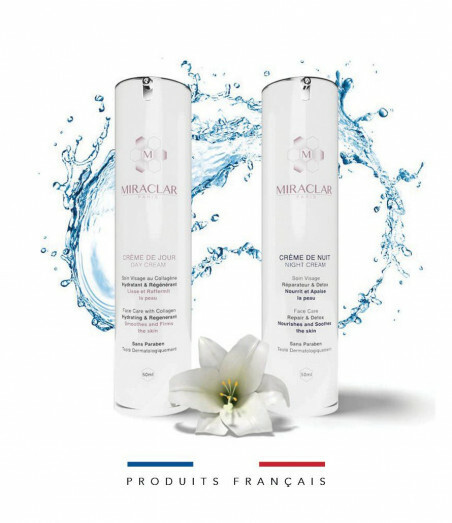 Bienvenue sur le site officiel de Miraclar Paris. La livraison est offerte à partir de 59 € d'achat ! Pack of two paraben-free facial cosmetics for a complete routine that meets the needs of all skin types. It contains: a moisturizing day cream and a nourishing night cream. Les deux produits sont super depuis que je les utilises je n'ai plus de probleme de sécheresse et rougeurs. Après plusieurs mois d'utilisation je remarque une nette amélioration de ma peau !! Peau plus lisse. Moins de petits boutons. Peau qui respire la fraicheur. J'ai enfin trouver chaussure à mon pied. Cette crème est vraiment une pure merveille. A quand une crème pour le contour des yeux !! Pour ma part, tous les femmes devraient utiliser ce produit. Crème de très bonne qualité et efficace. Enfin une crème qui équilibre la peau, pas grasse elle laisse la peau douce et belle, lissée. The Duo Pack from Miraclar Paris brings together a moisturizing day cream for the face and a nourishing night cream. 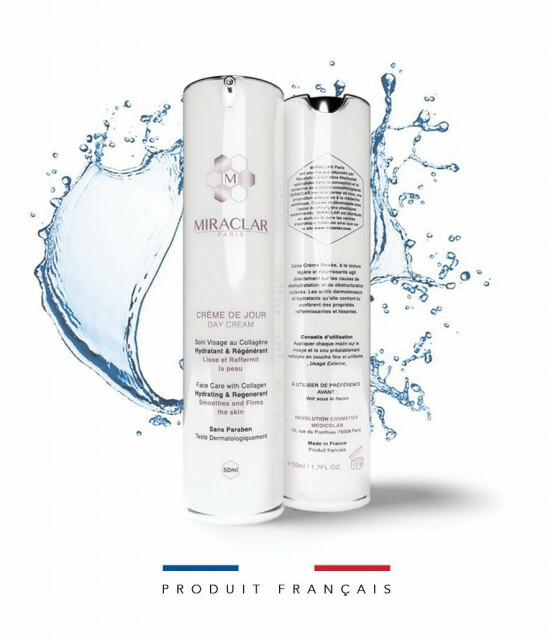 Day Cream - Miraclar Collagen Facial Care Paris is a paraben-free cosmetic that smoothes, moisturizes and nourishes deeply. With its unique and special active ingredients, it has an anti-aging action to reduce wrinkles and restructure skin tissues. The skin is more flexible, plumped and toned. The creamy texture of this moisturizing facial cream brings a soothing and refreshing side. With its antioxidant side, it blocks free radicals to protect the epidermis throughout the day. This treatment allows the skin to regain its radiance, softness and shine. 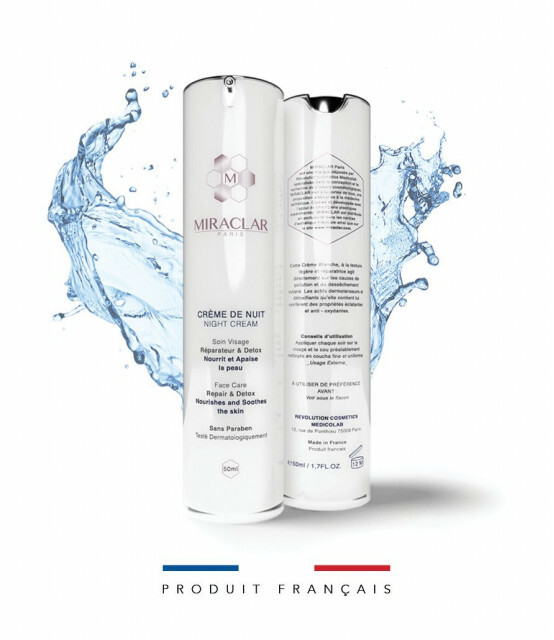 Night Cream - Miraclar Paris Detox & Detox Facial Treatment is a nourishing face cream that revitalizes, smoothes and softens the skin. The ingredients contained in its formula with soothing, refreshing and healing properties accelerate the regeneration of the skin at night, for a comforted and revitalized face every morning. With an anti-oxidant action, this paraben-free cosmetic combats skin aging and reduces wrinkles, while restoring the protective barrier of the skin. These two treatments of Miraclar Paris are part of an ideal routine to answer all the specific needs of all types of skins, at any moment of the day or the night. With daily and simultaneous use of both creams, the face is redesigned, sublimated and looks younger. - Organic silicon : it is a trace element that helps fight against skin aging and takes care of the skin’s health. It moisturizes deeply and gives it back its radiance. - Collagen : this protein, naturally contained in the body in the form of fibers, maintains the flexibility of the skin by ensuring the connection between the surface and the depth of the epidermis. It speeds up the process of tissue regeneration but unfortunately, its production decreases with age. 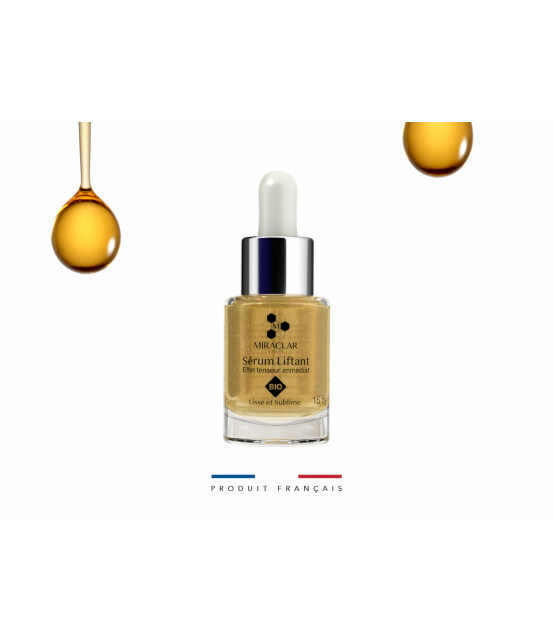 - Kigelia extract : with its tonic, plumping, firming, soothing and restorative properties, this ingredient revitalizes sensitive skin and soothes irritated skin. It also has a strong antioxidant power. - Vitamin E : it is a micro-nutriment in charge of the protection of cutaneous cells against free radicals. In addition to providing the necessary hydration and making the skin soft, shiny and smooth, it improves the production of collagen. - Allantoin : this active ingredient restores the radiance and suppleness of the skin by eliminating dead cells. It also has soothing, calming and regenerating properties. - Avocado oil : with its protective and restorative properties, it has an anti-aging action by reducing wrinkles. Regenerating, it allows the skin to regain its softness, flexibility and comfort. - Floral water of calendula : this hydrolate, with healing and soothing virtues against itching and irritation helps the repair of the epidermis. - Floral water of chamomile : anti-stress, it has an anti-inflammatory and calming action for the skin attacked. Organic Silicon is an essential trace element for keeping skin healthy. It brings the intense and necessary hydration of the upper layers of the epidermis and thus, reduces wrinkles and fight against skin aging. Thanks to this active ingredient, the skin regains its radiance. For this reason, it is very popular in cosmetic compositions. Collagen is a naturally occurring protein in our body. It ensures the regeneration of cutaneous tissues, just like their elasticity, by connecting the surface and the depth of the skin. This protein is part of the formulation of many anti-aging care, with the aim of boosting its production which, after 30 years, begins to decrease and leads to the appearance of wrinkles. The skin becomes more supple and toned. Kigelia extract comes from the fruit of this African tree, known for its soothing, restorative and revitalizing properties. The fruit contains several flavonoids including phylosterol which has an anti-inflammatory power for damaged and sensitive skin. Some of these flavonoids also stimulate the micro-circulation and the activity of the cutaneous tissue to fight, on one side the free radicals and on the other, the signs of the age. Kigelia extract gives toning, plumping and firming properties to the care in which it is found. Vitamin E is a micro-nutrient used in beauty products for its antioxidant and protective skin cells against free radicals. Thus, it promotes the maintenance of a healthy skin that regains all its softness and shine. In anti-aging skincare, this vitamin helps increase the production of collagen for a better regeneration of the epidermis. Ideal in specialized cosmetics for the night, it deeply hydrates for a smooth and comfortable skin on waking. Allantoin, appreciated for its soothing and restorative action, is part of the creams that restore the suppleness and radiance of the skin. It is often found in care for sensitive skin, even skin with imperfections (mixed to fat for example). This active ingredient facilitates the removal of dead cells and their regeneration. In addition, it maintains the hydration of the epidermis. Shea butter, extracted from the shea fruit, has a rich texture for nutrition and intense hydration of the upper layers. Thus, it restores the cutaneous barrier and relieves the torn skins, thanks to its calming and repairing power. Perfectly protected, the skin softens and regains all its brilliance and flexibility. Avocado oil, with anti-aging action is a valued component in the formulas of care that can limit the appearance of signs of age. It softens and nourishes the skin to restore elasticity, softness and comfort. It also has a restructuring and regenerating side, ideal to be used before sleep. Floral water - or hydrolate - Calendula regulates and repairs the skin, including combination to oily skin. Its anti-itch and anti-irritation side gives it soothing and soothing properties. It is also known to improve healing and disinfection of wounds. The floral water - or hydrolate - Chamomile has an anti-inflammatory and analgesic. It also helps to refresh the skin. Anti-stress, it reassures the skin after the aggressions undergone daily. Moisturizing night cream (no paraben), with shea butter and avocado oil to nourish, soothe and regenerate the skin, subject to external aggressions throughout the day. Moisturizing facial day cream with collagen. Smooth and firming, it makes the skin soft and comfortable effectively. This BIO-certified balm without preservative or coloring or synthetic fragrance moisturizes your dry lips with the Shea butter and vegetable oils it contains (Argan, Sunflower and Soy). Day Cream + Night Cream + Organic Lip Balm. This BIO-certified balms without preservative or coloring or synthetic fragrance moisturizes your dry lips with the Shea butter and vegetable oils it contains (Argan, Sunflower and Soy). Without Paraben facial cosmetics box for a complete routine that meets the needs of every day for all skin types. This full face care kit contains: micellar lotion,four regenerating mask in bio cellulose, a moisturizing day cream, a nourishing night cream and an organic lip balm. 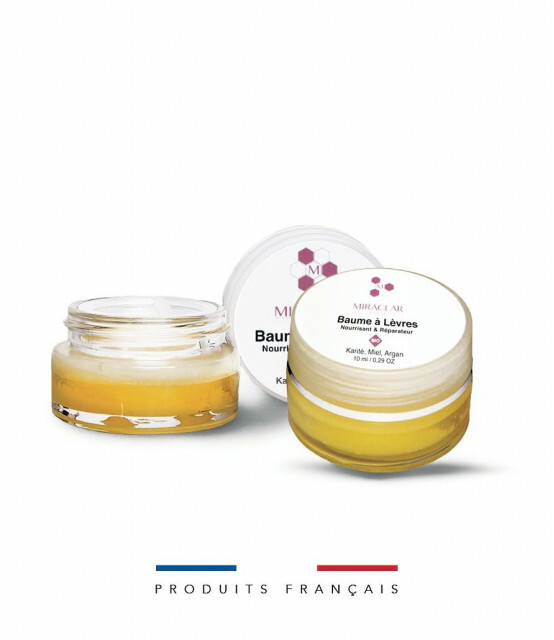 Ce baume certifié BIO sans conservateur ni colorant ou parfum de synthèse hydrate vos lèvres desséchées grâce au beurre de Karité et aux huiles végétales qu’il contient (Argan, Tournesol et Soja). La Lotion Micellaire By Miraclar, démaquille, nettoie et adoucit les peaux tiraillées par les agressions du quotidien. Ce sérum BIO, lisse et donne de l'éclat à votre teint ! Il est tenseur et liftant et à base d'eau d'immortelle et d'alpe vera. Coffret de trois cosmétiques sans paraben pour le visage pour une routine beauté idéale qui répond aux besoins de tous types de peaux. 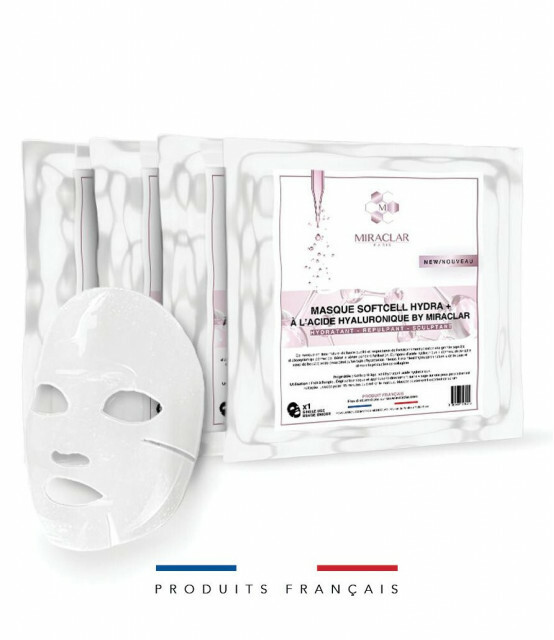 Ce coffret soins visages intégral contient : une crème de jour hydratante, une crème de nuit nourrissante et une lotion micellaire nettoyante, démaquillante et hydratante. Patchs hydrogel pour les yeux, votre allié contre les cernes. 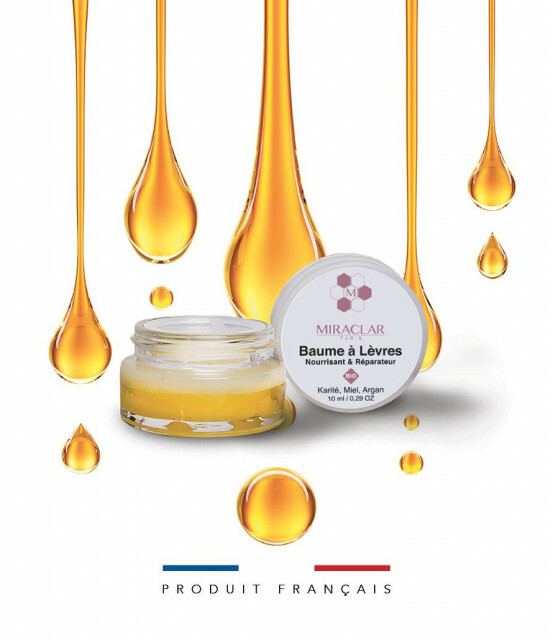 Ces baumes certifiés BIO sans conservateur ni colorant ou parfum de synthèse hydrate vos lèvres desséchées grâce au beurre de Karité et aux huiles végétales qu’il contient (Argan, Tournesol et Soja). Coffret de trois cosmétiques BIO pour le visage qui constituent une routine beauté idéale qui répond aux besoins de tous types de peaux. Crème concentrée en lipides et collagènes marin. Cette crème onctueuse et nourrissante reconstitue les couches supérieures de l’épiderme. Elle protège la peau au quotidien en lui offrant fermeté et souplesse. L’extrait de Spilanthes Acmella cible la dynamique cellulaire pour renforcer l’architecture dermique et lutter contre les marques du temps. L’effet densifiant du Spilanthes dans cette crème redessine le relief cutané. En surface, les traits sont lissés et l’ovale du visage redessiné. La forme soluble du collagène renforce l'élasticité des tissus et améliore sa capacité à préserver une hydratation constante. Crème de nuit hydratante sans paraben à base beurre de karité et huile d’avocat pour nourrir, apaiser et régénérer la peau, soumise aux agressions extérieures tout au long de la journée. 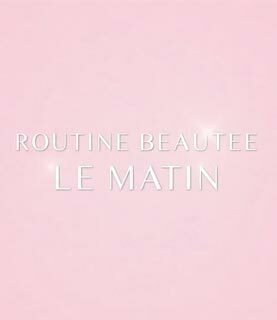 Coffret de cosmétiques sans paraben pour le visage pour une routine complète qui répond aux besoins de tous les jours pour tous types de peaux. Ce coffret soins visages intégral contient : une crème de jour hydratante, une crème de nuit nourrissante, un baume à lèvres Bio, quatre masque régénérant en bio cellulose, et une lotion micellaire. Coffret de trois cosmétiques sans paraben pour le visage pour une routine complète qui répond aux besoins de tous types de peaux. Ce coffret soins visages intégral contient : une crème de jour hydratante, une crème de nuit nourrissante et un baume à lèvres Bio. Le Christmas Pack Miraclar comprend 5 références doublées ! Ce coffret soins visages intégral contient : une crème de jour hydratante, une crème de nuit nourrissante, un baume à lèvres Bio, un masque régénérant en bio cellulose, un masque acide hyaluronique, un patch pour les yeux, une lotion micellaire et un sérum liftant. You can unsubscribe at any time. To do this, please find our contact information in the legal notice.